Little Friends for Peace (LFFP) stands in solidarity with immigrant families separated at the US border. We deplore a government system that chooses to separate family members rather than collaborating across divides to repair a damaged immigration system and address the conditions that drive immigration. 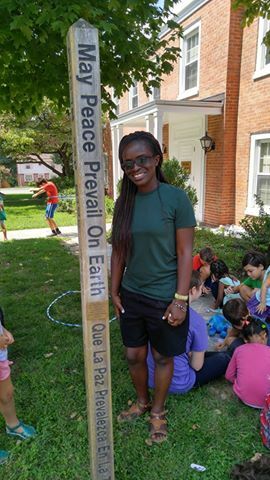 LFFP interrupts violence by teaching skills for peace to children and adults regardless of immigration status, ethnicity, race, gender, or sexual orientation. Rather than dividing, we teach skills for building the Beloved Community. Rather than causing trauma by ripping families apart, we build resilience and help people heal. We invite everyone to experience, learn, and practice peace with LFFP programs as we continue to hold immigrants families and all families in the Light. Center of Concern (Center) is a non-profit organization that researches, educates, and advocates from Catholic social tradition to create a world where economic, political, and cultural systems promote sustainable flourishing of the global community. The Center executes their mission by engaging with influential people and organizations that promote a similar mission of building a global and sustainable community. In April 2018, Education for Justice (EFJ), a project of the Center, asked LFFP’s Co-Directors MJ and Jerry Park to write an article for EFJ detailing their own mission, and how they advocate for peace and teach communities and individuals new practices and skills in order to promote peace at individual, community, and global levels. MJ and Jerry’s practices have been present in our society for 35 years. In 2018, violence has become normalized within our everyday lives. 78% of children from low income families in Washington, D.C., are exposed to violence before the age of 4. The desensitization and depression that has become a reality for so much of our country is because we have all been neglecting to take care of one another. As MJ and Jerry’s article highlights, the only way to fix the anxieties and pain that we all feel is to come together as a community and help one another learn the skills necessary to find individual and global peace. To read MJ and Jerry’s article, please go to the Education for Justice website by clicking here: ​https://educationforjustice.org/resources/learning-live-gospel-nonviolence. Little Friends For Peace will be marching to end gun violence- AND working as we have for 37 years to replace the guns with skills for peace. Meet us at: Archives Metro Stop, 11 am, Saturday March 24. With daily practice in the loving tools and practices of nonviolence, LFFP equips people to build a culture of peace: to create healthy relationships in our schools, communities, and homes. We need to stop and heal from the trauma, from the fear and the anger that make people feel the need for guns. We need to rewire our brains to respond, not in anxiety and paranoia, but in trust and creativity. We can build the beloved community of healthy minds and bodies with loving hearts. Each day we can start with the Wellness Wheel to ground ourselves, then invite our families, colleagues, and students to share what's going on inside that delights and what demands effort and courage today. We can share our gifts and talents. We can trust in our skills to resolve conflicts and restore our relationships with compassion and empathy. LFFP offers the care and skills to let go of our fears and to build caring communities where we all can share, shine, and win. Please join us and dance with us in a culture of peace! My name is Brian McLauchlin and I am at LFFP as an intern through Eastern Mennonite University in Harrisonburg, VA. Currently I am earning an MA in Conflict Transformation, but my focus is on trauma and healing. While at LFFP, I want to lead our organization through a process for becoming “trauma-informed.” What “trauma-informed” means is that we, as a staff, become more aware of the influence of trauma in the lives of the children and adults with whom we work. Such knowledge helps us in the tools we use to build skills for peace. More importantly, such tools should be geared toward healing, healing of self and others. ​One peace skill we can use toward healing, for example, is the use of movement. Sometimes at McKenna Center, we have the men stand up and do some simple exercises. At the after-school program or in Summer Peace Camp, we have the children do exercises. Although such activities may seem “simple,” such techniques helps people connect with their bodies. Research has shown that trauma can disconnect a person from his or her body, even to the point that people can lose bodily sensations. Under such circumstances, people can operate in their head, but are not able to function well within the body. Exercises, such as yoga or other bodily movements, can help one to connect with the body so that there is a more fluid movement between mind, body, and spirit. This connection helps to promote healing in our clients. While at LFFP, I hope to highlight such techniques.